Optical Coherence Tomography angiography relies on motion for contrast and requires at least two data acquisitions per point-wise scanning location. We present a method termed Spectral Contrast Optical Coherence Tomography Angiography using visible light which relies on the spectral signatures of blood to obtain angiography from a single scan using endogenous contrast. We demonstrate the molecular sensitivity of this method enabling lymphatic, blood, and tissue discrimination. 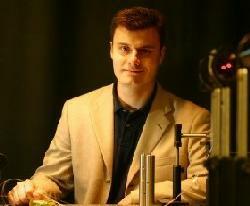 Vadim Backman, PhD, is a Professor at Biomedicam Engineering, Northwestern University. Research Interests: Optical imaging, Minimally invasive optical diagnosis and imaging of early cancer, Coherent backscattering spectroscopy for tissue diagnosis, Fractal organization of cells and tissues, Analysis of nano- and micro-architecture of living tissues using light scattering spectroscopy, Light scattering and propagation in random/turbid media.